When the 2014 Olympians and Paralympians won medals in Sochi at the Winter Games, they really won some hardware. Not that I'd expect anything less, but let's just say that Keith Gabel's bronze medal, which he won in para-snowboard cross, was H-E-A-V-Y. According to details about the medals presented in Sochi, it should be. Each medal is 10mm thick and has a diameter of 100mm. While the Olympic medals weigh between 460 and 531 grams, the Paralympic medals weigh between 585 and 686 grams. The metals used to make these medals come from Russia. The bronze medal, which I got to check out in more detail courtesy of Keith Gabel, is made of 585 grams of bronze. The Paralympic medals are designed in the same style as the Olympic medals, but they also have inscriptions written in Braille. It takes roughly 18 hours to make one medal--and 1,300 were produced for the Games! 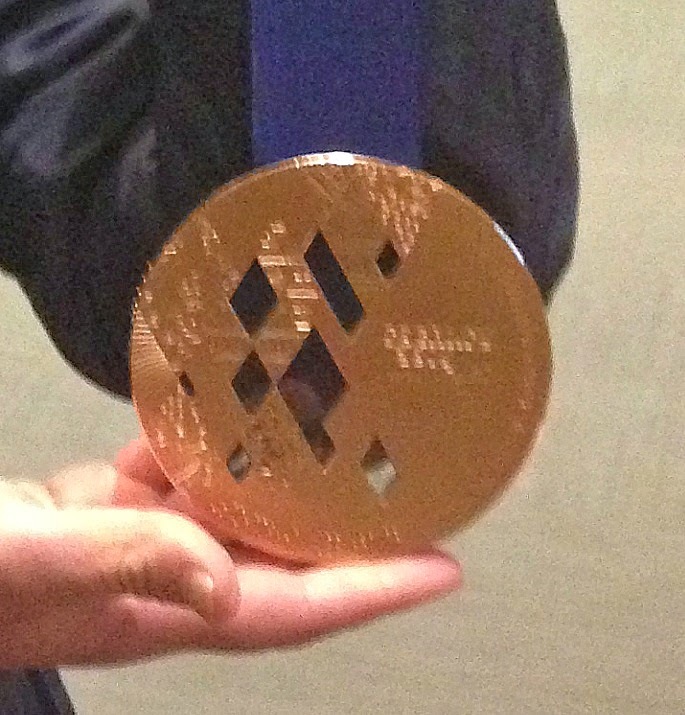 I got up close and personal with the bronze medal Keith Gabel won in para snowboard cross at an event Thursday night in Colorado Springs (so glad I randomly found out about that one!). But I didn't dare wear it around my neck after he gave the OK to look at it. Gabel said the medal could get tarnished if it touched a zipper, so I kept it as far away from my jacket as I could. After listening to Gabel speak about how his road to the 2014 Paralympic Games, I still had one question: How did he wear this hardware around his neck for his hour-long presentation and not show any signs of it weighing him down? He must have gotten used to wearing it for long hours celebrating post-race in Sochi!